This unique long distance service aims to make the long distance communication process increasingly convenient for consumers in a number of ways. 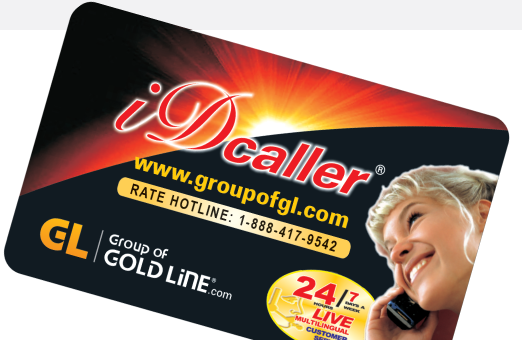 Gold Line’s iDcaller service is for American consumers. This service is part of a large rechargeable Automatic Number Identification (ANI) service platform. The major added convenience with this service is its ability to recognize you as the account owner from a particular registered phone number (which you manually input into the system), meaning no PIN entry is required. Numerous phone numbers can be registered, and once you have done so, whenever you dial the designated access number from these phone numbers, you simply dial the destination number immediately after; (and avoid punching in a long PIN). This service can also be used while you travel. We have designated local & toll free access numbers in most major cities in the United States and numerous locations worldwide. Consumers simply dial the access number, punch in their PIN, and dial the destination number. Our iDcaller phone service is also rechargeable. Unlike most phone cards, you do not need to visit a retail outlet and purchase another phone card once you have used up your minutes. You are given your very own account, which you can recharge conveniently online at any time with your credit card. iDcaller also offers a unique Auto Recharge option! Set this option and never have to recharge your account again! Auto Recharge gives you the ability to set a desired recharge amount for your iDcaller account whenever you reach a preset minimum balance.